When it gets down to the wire with guests arriving in less than 24 hours and it's realized that there aren't enough desserts, what does one do? 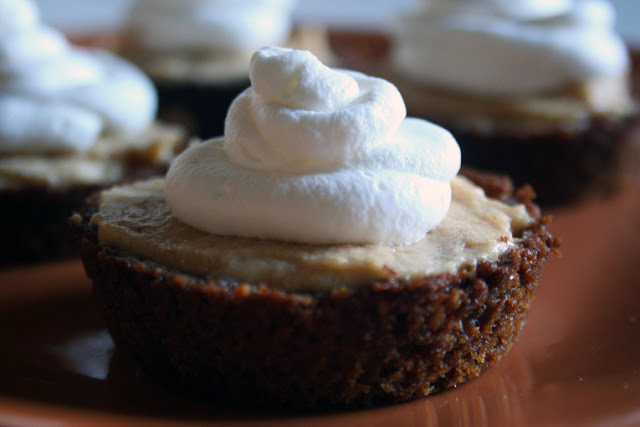 This Mini Peanut Butter Cream Pie is a rather efficient little homemade treat that leaves the complexities on the side and eases right into any dessert spread. The graham cracker crunch and sweetened peanut butter cream pair well for a wanting mouth and hungry belly and will surely be a new household favorite. Holidays or otherwise, this dessert hits the spot in two to three bites! Crust: Prepare crust as directed in the Pumpkin Pie with Graham Crumble recipe, only add cinnamon and do not remove any of the mixture before adding the water. 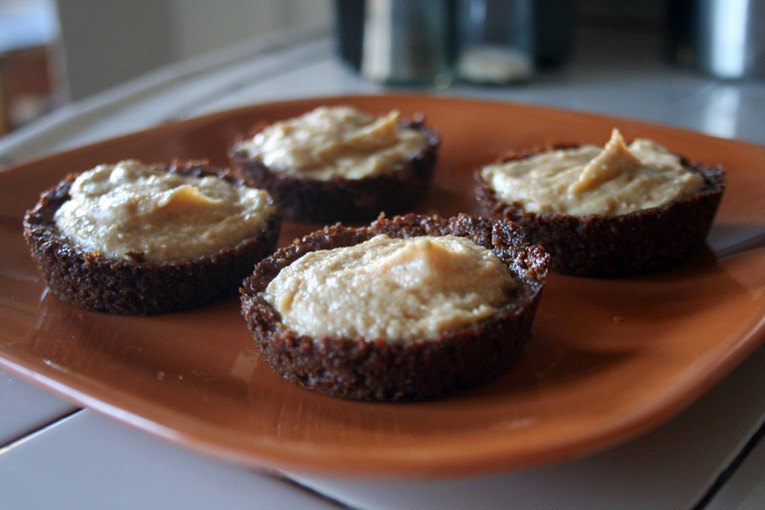 Press into a non-greased muffin tin with about 1/2" up to form the miniature shells. 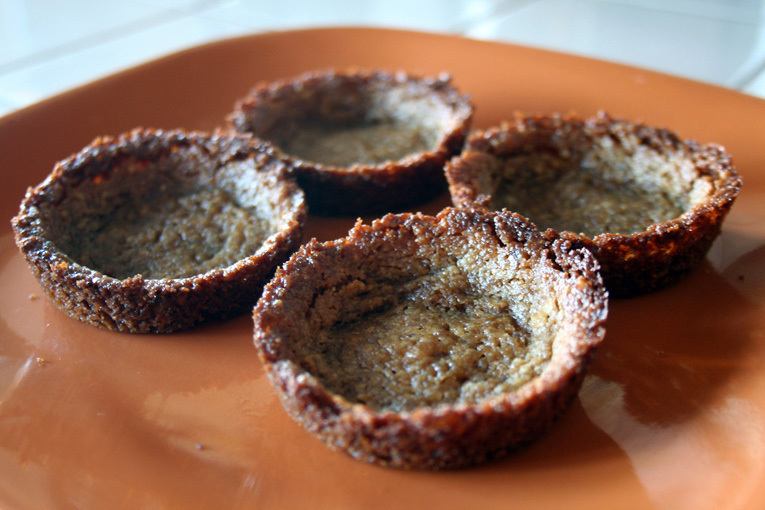 Bake at 375 degrees for 12-15 minutes or until edges are slightly brown. Set aside to cool before removing crusts from tin. Note: If at the 8-10 minute mark the crusts begin to rise, use a small glass or spoon to flatten the center and cook for the remaining time until edges are slightly brown. Whipped Cream: Whip the heavy whipping cream with sugar and vanilla until the form holds when a spatula is run through it. Remove half of the whipped cream into a small mixing bowl and fill a pastry bag with the remainder. Place pastry bag in fridge to cool. 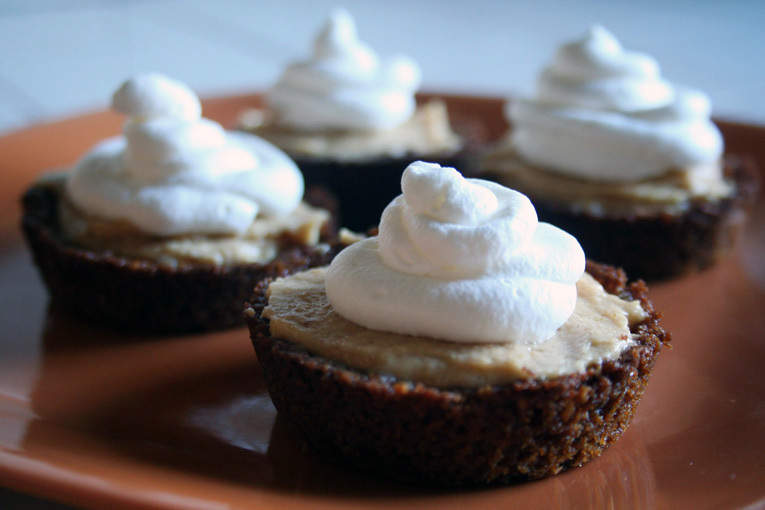 Filling: In the small mixing bowl, fold the peanut butter into the whipped cream until just blended. Be careful not to over-mix or the cream will start to flatten. Fill the crusts and spread to edges with spatula. If using a pastry bag, pipe a small swirl of whipped cream onto each filled crust. If not, spoon a small amount of cream and shape as desired. Place in refrigerator to firm, and enjoy! !